Why Buy Rainforest Trees and Shrubs? 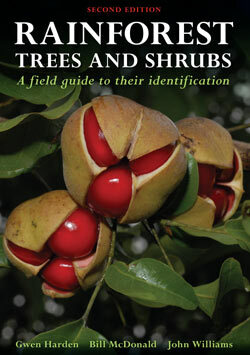 Rainforest Trees and Shrubs is a “must have” guide book for amateur and professional biologists and naturalists who need to know about, or are interested in, the rainforest trees and shrubs that are endemic (native) to mainland sub-tropical Australia. This Australian rainforest reference resource will be widely used by professional and amateur botanists and ecologists, entomologists, environmental consultants and planners, architects, horticulturalists and landscape designers, students, school teachers and university lecturers and by rainforest enthusiasts and gardeners. The rainforest guide will enable many, who until now have been confused and overwhelmed by ‘all the green leaves’ to identify and recognize species that grow in their local rainforests. The introduction outlines the basic leaf characters that are used in the identification of the species and diagrammatically illustrates and compares the various rainforest types that occur in the area.